Whether at school, at nursery or at home: children love painting, colouring and crafting, it’s great fun and play a decisive role a child’s development. Staedtler has a wide range of products with accompanies users their entire life from early age on, thereby enabling a visualization of inspirations and ideas over generations. Staedtler, one of the oldest industrial companies in Germany, takes advantage of the great tradition of Nuremberg pencil-makers. It was founded by Johann Sebastian Staedtler in 1835, but one of his ancestors, Friedrich Staedtler, had already been active as a ‘lead-pencil maker’. Records of him date back as far as 1662. Children can get very enthusiastic while drawing, coloured pencils invariably have to withstand quite a bit of pressure! That’s why Staedtler has come up with the world’s one and only Anti-Break-System (A-B-S for short). Thanks to A-B-S, the white protective coating that surrounds the colour-intensive high-quality lead core like a second skin, the break-resistance of all Staedtler coloured pencils is increased by up to 50%, making the pencils up to 30% stronger. Staedtler pencils ideal companions whatever the age, whatever the level of development: hexagonal pencils in 6 mm and 4 mm lead diameter for very small children’s hands and perfect ergonomic triangular-shaped coloured and learner’s pen cils in 4 mm lead diameter. So easy to make changes and corrections with Staedtler Noris Club erasable colouring pencils. Particularly suitable for school-minor mistakes can be corrected immediately with the pencil’s PVC and latex-free eraser tip. Noris Club watercolour pencils for a wide range of creative creative possibilities when colouring, drawing or watercolouring with water and brush. Colour-intensive “dry” artworks or atmospheric watercolour paintings, our watercolour pencils offer unlimited creative possibilities. Whether for making quick sketches when out-and-about or for doing more detailed work back home, STAEDTLER ergosoft aquarell watercolour pencils can always be relied upon to transfer your ideas to paper perfectly. Perfect ergonomics thanks to triangular shape. Easy to sharpen with any quality sharpener. 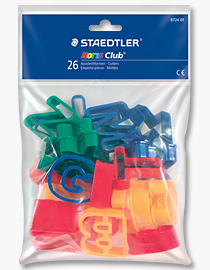 Staedtler pencil sharpeners, erasers, glue sticks, scissors are also available in matching Noris Club design. New additions to the Noris Club family – painting and modeling in nurseries and schools. 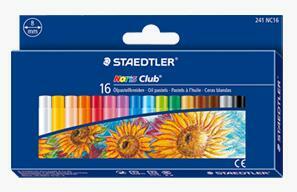 Noris Club is Staedtler’s extensive school range. 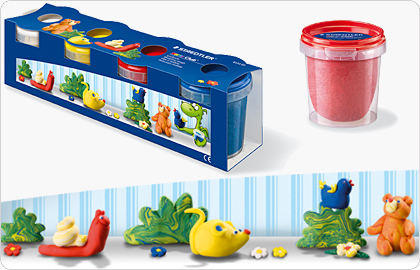 From 2010 on, a series of creative products for pre-school and nurseries are joining the existing Noris Club range. The products shine in new splendor in the newly designed boxes. Noris Club modeling dough offers a whole variety of options for fun and games. When children feel, cut and shape dough, they are not only having fun modeling, they are fostering their sensory and motor skills at the same time. Its stimulates the imagination and power of invention. Whether a bowl for small treasured items, an elephant seen in the zoo the day before or models of family members – creativity can be endless. School-beginners can let their imagination run wild with this Noris Club modeling dough set and, thanks to the 40 different shaped cutters enclosed, can practice their letters and numbers at the same time. Learning becomes a fun. 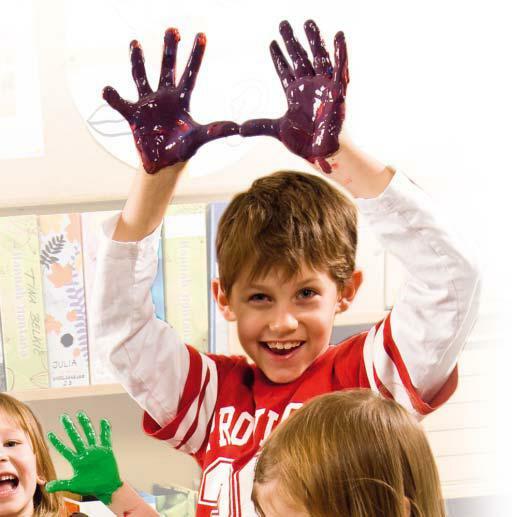 Painting with hands strongly stimulates children imagination to create their first work of art – and have fun at the same time. The paints are light fast, can be diluted with water , blend well, wash out easily ans are, naturally, ‘Made in Germany’. These cute Staedtler Noris Club rubber stamps ensure that every painting is a success. 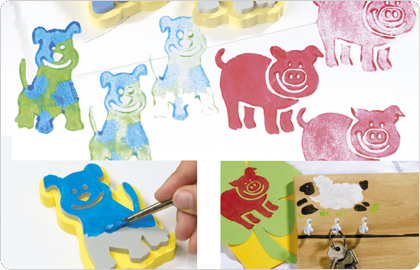 They are suitable for a variety of stamping techniques and can be used by even small children hands. They very easy to clean and motifs can be used again and again. Wax crayons are made of natural beeswax. This compact and waterproof crayons offer a wonderfully soft performance and, thanks to the high wax content, are ideal for a variety of techniques. The wax crayons triangles with recessed grip ensure colouring fun galore for youngest children. Thanks to the gel-like wax lead, colouring with these new gel crayons is an extremely smooth experience. The lead is particularly soft and glides across paper as if by magic. An extra-soft and break-resistant gel crayons are available in 6 colours – both with or without glitter. Suitable for use on windows. Brilliant and colour-intensive oil pastels are great for colouring larger areas. The crayons are so very soft to apply and they easily adhere to all smooth surfaces as well as to cardboard or wood. 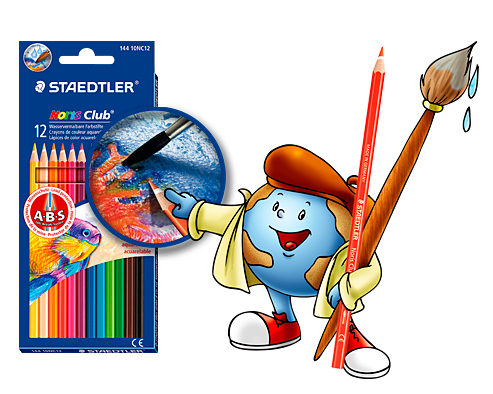 The STAEDTLER Noris Club oil pastels offer a standard-sized, round crayon diameter of 8 mm. Colours blend beautifully, they are ideal for layering, scraping and smudging techniques. Opaque – even on dark paper. Drawing can be a fun with this fibre-tip pens. They have sturdy, pressure-resistant tip. Ergonomic, triangular barrel for effortless, fatigue-free writing and colouring – easy to grip and hold for smaller hand. DRY SAFE: can be left uncapped for days without drying up (test ISO 554). Pens stains can b e washed out of most textile. Environmentally friendly water-based ink. Staedtler fibre-tips pens are equipped with ventilated caps (there is a little hole in the top of the cap) to reduce choking hazard if a cap is swallowed by children. Pens made in triangular and short round shapes. But great fun is a Magic Box. 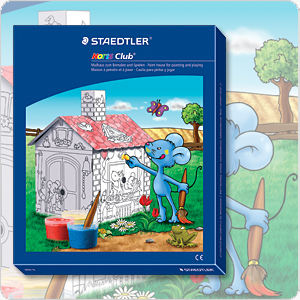 Younger artists can create a home of their own with the Staedtler paint house. It promotes creativity and stimulates imagination and is ideal for use in nurseries, at birthday parties or simply at home. The outline motifs on the house tell stories of their own and inspire both young and old alike to get creative. The sturdy house is quick to assemble and, when required, to dismantle too. Staedtler not only offer a wide range of innovative new products for children but has a great support too. There is no need to buy ‘Colour Me’ books, you can download, print and colour free STAEDTLER seasonal colouring pictures! And even more, just visit a brand-new Noris Club website. Nori will show you how pencils are made and of course, there are games to be played as well. Nori offers different puzzles, treasure hunts and pictures to colour in and also provides access to useful downloads, such as timetables. And, for important messages and special occasions, you can find funny e-cards. 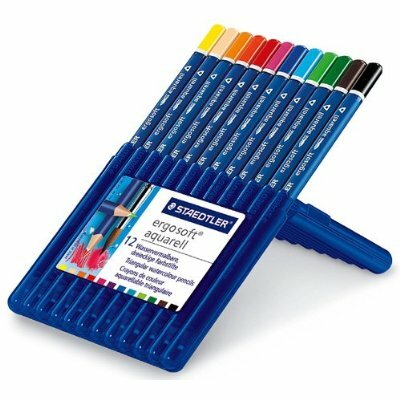 So, by now you should be very excited to trying new stuff, and may be you have a story to tell about Staedtler products? If so, we’d love to hear from you. Please write to us at bizladyshop@gmail.com, quoting the reference ‘Inspirations from Staedtler’. 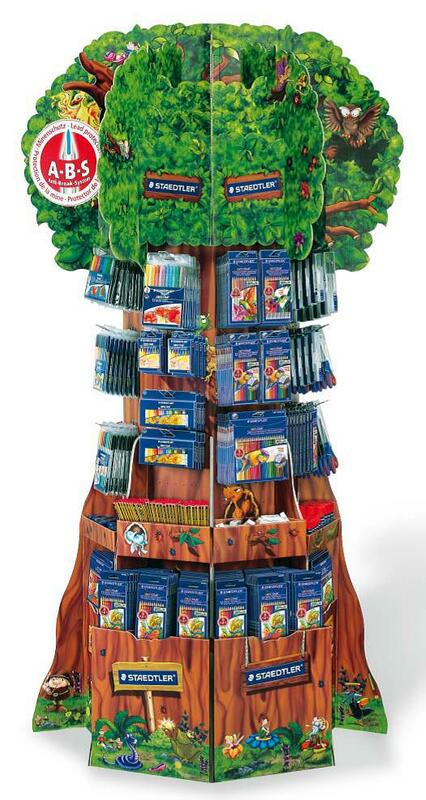 You should enclose any relevant pictures you may have and, we will add it to our blog and Facebook to ‘inspire’ others to use Staedtler products from Noris Club ‘Magic Tree’. Educate children and granulation colors to them is the responsibility of all of us.